How To Set The Language I Want To Use In Code? Can I Change Some Or All Of The Resources? Can I Use Language That Is Not In The Language Pack? What Code Do I Need to Localize The User Interface and Field Names? How Do I Refine The Provided Localization? What Code Do I Need to Localize Actual Report Data? Does It Support Right-To-Left Languages? What Needs To Be Installed on The Server and Browser? Izenda provides a localization package capable of localizing the Izenda UI, and Field Names into other languages. What version of AdHoc supports the Language Pack? The following languages are currently supported. More are being added based on customer demand and are available upon request. Please contact your sales rep or sales@izenda.com if you need additional languages. What Are The Codes Next To The Language Names? The Izenda localization capability is built on top of Microsoft’s .NET localization API. The Microsoft .NET localization API assigns a specific culture code to each language. For example, American English spoken in the United States is en-US. For localization, Izenda uses .Net managed resources Files (*.resx), which are standard resources for .Net. Resource files are XML-formatted text files, so you can edit it in an XML editor or even any plain text editor. 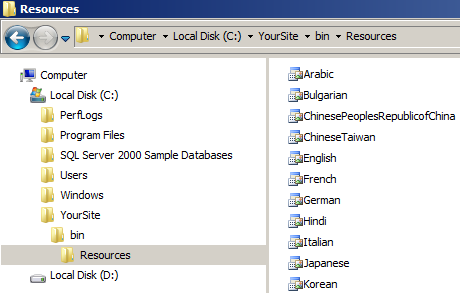 The language pack consists of a set of *.resx files inside “Resources” folder. You should copy this folder to the “bin” folder of your website(Izenda.AdHoc.dll should be in that folder). 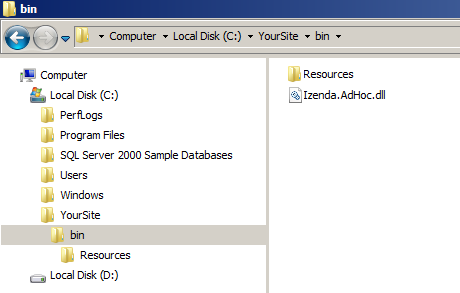 It's easy to find it, just locate the folder where Izenda.AdHoc.dll is. Locate the “bin” directory inside the folder with your website. It should contain file named “Izenda.AdHoc.dll”. Refer to section What Languages Are Included? and get from localization pack the *.resx with name corresponding to the language you need (in our case this will be “French.resx” file). Copy that file from the localization pack into the previously created “..\bin\Resources” folder of your website (in our case the full file path will be “..\bin\Resources\French.resx”). Replace your license key with one supporting localization. Please contact support@izenda.com or your account manager for details. You should specify the AdHocSettings.Language. This should be done in the InitializeReporting() method in the CustomAdHocConfig class in the Global.asax file. You can set this globally for all users or use logic to change the language per user or per tenant as you like. The “name” attribute should be as it is. You can change values inside <value></value> nodes. That’s it. Save the file and restart IIS and you’ll see the changes immediately. Note: If a modified *.resx file is not in the “bin\Resources” folder of your site, you should copy it there. If you didn’t find the language you want to use in Language Pack (see “What Languages Are Included?” section) you can contact your sales rep or sales@izenda.com to get it. The following settings need to be applied to the PostLogin() method of the CustomAdHocConfig class. Add an alias for every field that needs to be localized or perform a dynamic lookup from the database. The Izenda.AdHoc.AdHocSettings.LabelAliases collection may be used to provide more granular UI localization if the provided localization is not sufficient. Data may be localized by overriding the AdHocConfig.ProcessDataSet() method and dynamically changing the DataSet returned by the database. Now you should add some code to the master page code behind file. Since you may change localization almost anywhere in the code, it is required to check the language every time a page is loaded. The best place to do this is in the Page_Load method of the page. The Microsoft Language must be installed on the server as well as the browser for the fonts to display properly. Please download the language file from Microsoft’s web site. The Izenda Localization Pack assumes that the server and user have the proper resources installed.